Hopping out of a minivan shared with French and Swiss travelers we’d met at the Vientiane’s bus station, we expressed relief that we hadn’t taken our more frequent form of Southeast Asian transportation – the tuktuk – to get there. The 25 km. (15 mile) ride from Vientiane to Buddha Park had taken us through extremely bumpy and dusty backroads. Though our journey would’ve undoubtedly been more ‘adventurous’ by tuktuk, it also would have been more painful to our bottoms given the lack of shocks in the scrappy little vehicles. 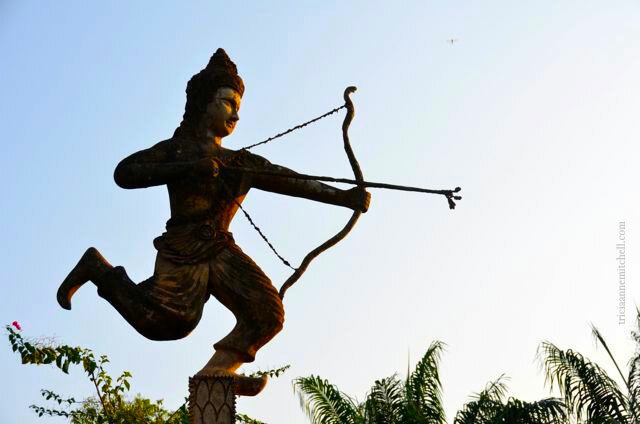 The sculpture park is known locally as Wat Xieng Khuan, or ‘Spirit City,’ and though its name implies otherwise, Buddha Park does not have a temple. 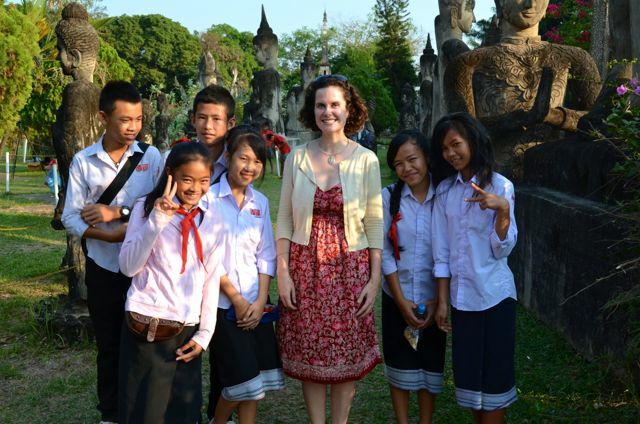 In fact, during our late afternoon visit last January, it was brimming with lively Laotian students clad in red, white and blue school uniforms that lent them a French air. With all the youth there, the atmosphere was more amusement park than meditative on the day of our visit, though I’ve read that some monks do use the park for the latter purpose. 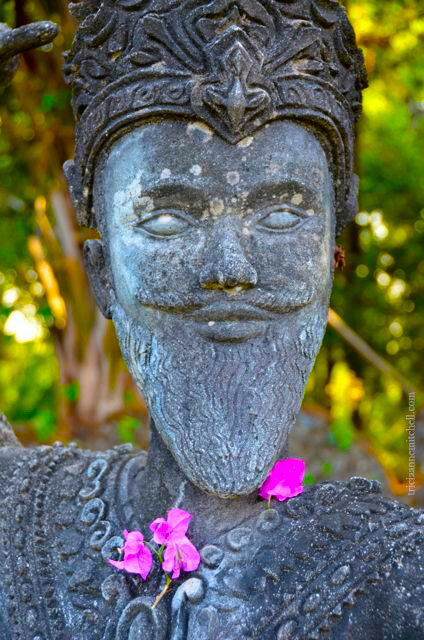 Fuchsia bougainvillea blooms carefully placed in the statues’ open palms reminded visitors of the park’s more spiritual side. 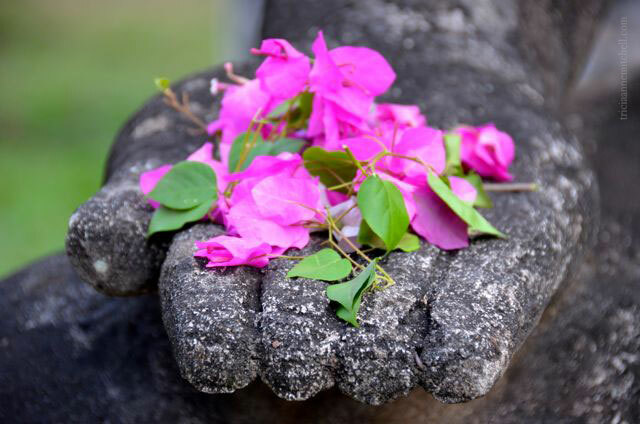 Bougainvillea blossoms in the palm of a statue’s hand. 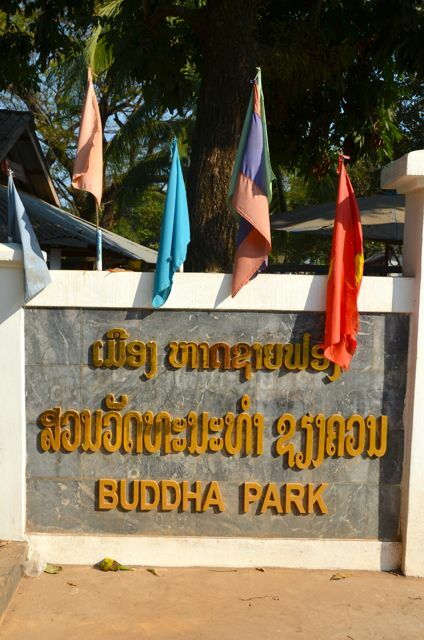 Construction of Buddha Park started in 1958 by Luang Pu Bunleua Sulilat, who oversaw a similar park’s construction in neighboring Thailand. 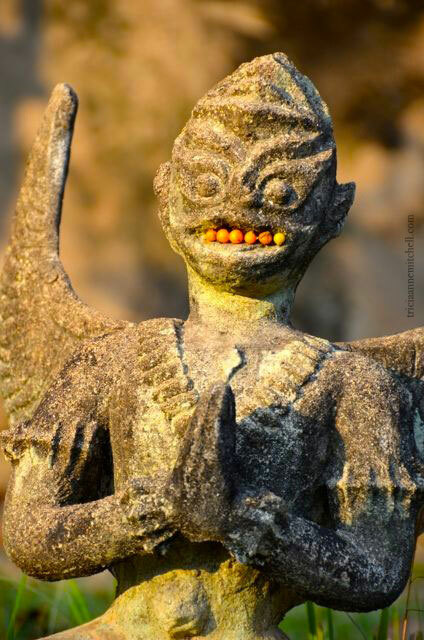 There are Buddha statues, Hindu characters like Shiva and Vishnu, and humans, animals and demons. 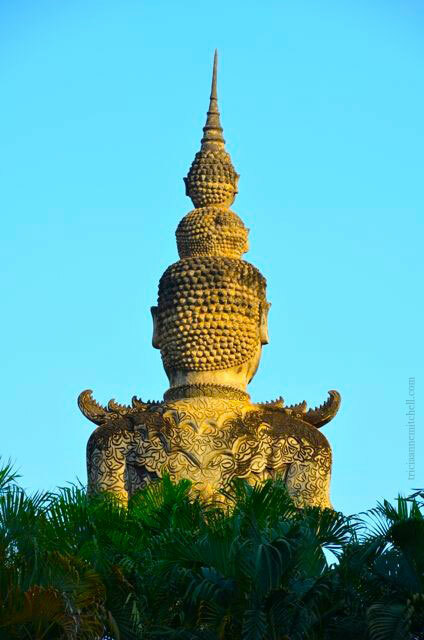 When we walked into the park, we were conflicted whether to be drawn first to the enormous pumpkin-like sculpture – with levels that represent hell, earth and heaven – or the reclining Buddha, which measures 120 meters (or 390 ft.). The great pumpkin won us over, and we were soon climbing into its ‘mouth’ and ascending the various levels. The bowels of the pumpkin resembled an odd statuary storeroom of sorts, but the panorama of the park from atop the ‘pumpkin’ was lovely, in a manicured and whimsical sort of way. We were surprised that some visitors went so far as to sit on the brittle railing, and shuddered to think what would’ve happened had it snapped. Entering the ‘pumpkin’ sculpture to find a room resembling a statuary storeroom, and a staircase leading to a platform with a marvelous view of the park. Sitting atop the big ‘pumpkin’ sculpture. Beware of this precarious railing that some visitors sat upon! As we meandered through the park, we suddenly felt as though members of the paparazzi were following us. Groups of youth congregating near the large pumpkin giggled nervously, while sneaking peeks at us, until one brave interpreter broke the ice. “Can we take your photo?,” the young Laotian teenager asked Shawn. And then a group of boys and girls approached me. One had an American flag emblazoned on his bag. 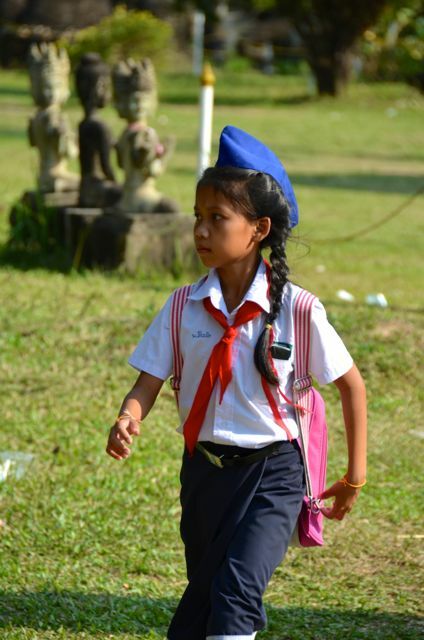 The girls wore uniform Laotian sinh or skirts. Noticing the merriment of the children and adults at the park, we transitioned into a mischievous mood, mimicking some of the human forms. 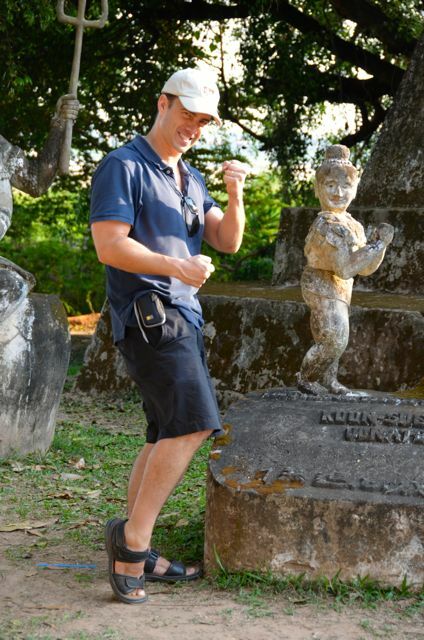 Next to a diminutive bodybuilder-like statue Shawn struck his most convincing Arnold Schwarzenegger pose. I sprawled out next to an empty fountain adorned by a stone bathing beauty of sorts. 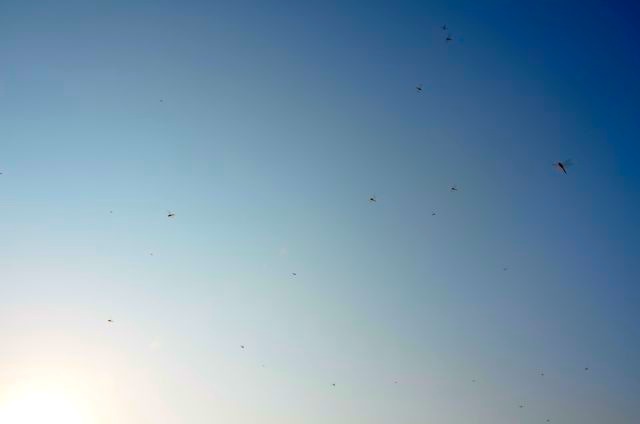 As we continued our stroll, we noticed the soon-to-slumber sun highlighting the iridescent wings of hundreds of dragonflies flitting in the air. In an attempt to show the park’s more solemn side, I tried to compose a photographic scene replete with spiritual offerings – marigold flower garlands and half-full Pepsi bottles sitting at a statue’s base. Suddenly, a young girl hopped in front of my lens, her braids swinging back and forth, a wide grin on her face. Her father was at first embarrassed that she’d strutted in front of my camera and tried to lead her away, but within minutes I was doing a photo shoot with the outgoing girl and her older brother. 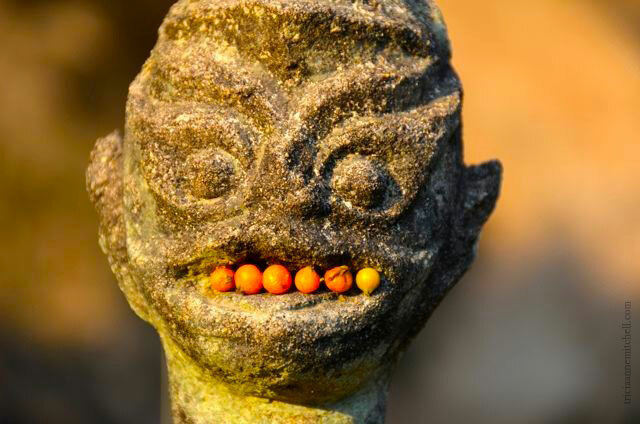 They flashed peace signs, rode in the mouth of a crocodile or naga figure, and tried to mimic the park’s sculptures. So much for being solemn or spiritual. 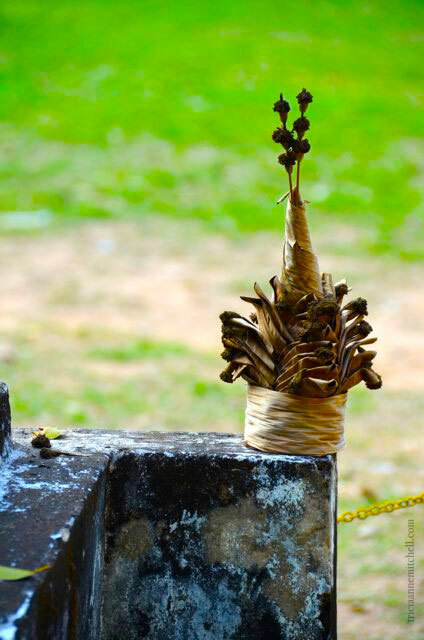 On this day, Buddha Park was a spirited place. A little lady playfully entering my picture; her father (who was embarrassed that she’d invited herself in front of the camera) has his hand on the left trying to coax her back. 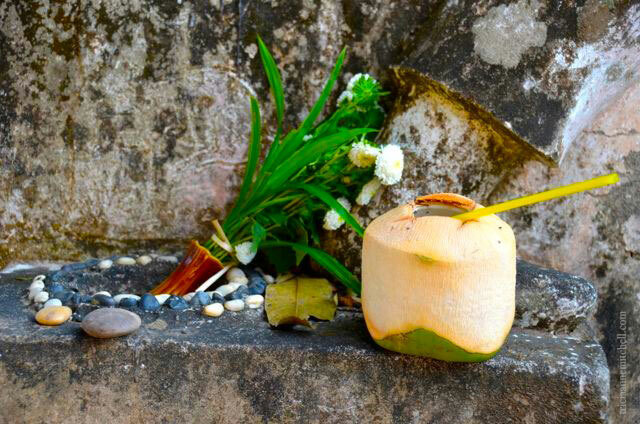 Coconut water and flower offerings. 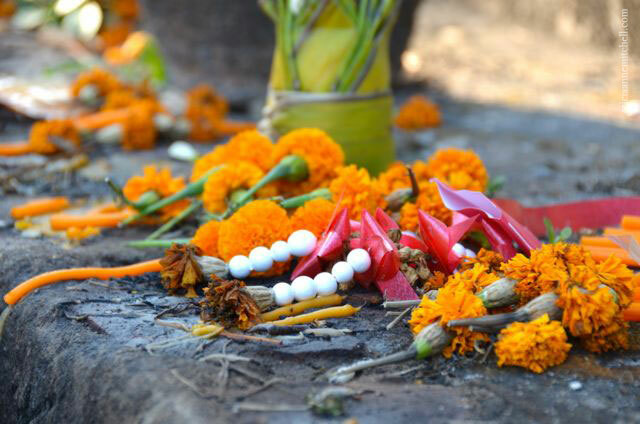 Before visiting Buddha Park, we’d read that it was advisable to go there by taxi instead of by tuktuk, to avoid the notoriously-dusty, bumpy road. We negotiated a fare with a minivan driver at Vientiane’s bus station, and once en route, were happy we’d done so. Depending upon traffic, it takes about 30-45 minutes to get there. Admission is 5,000 Kip – roughly .65 American cents. 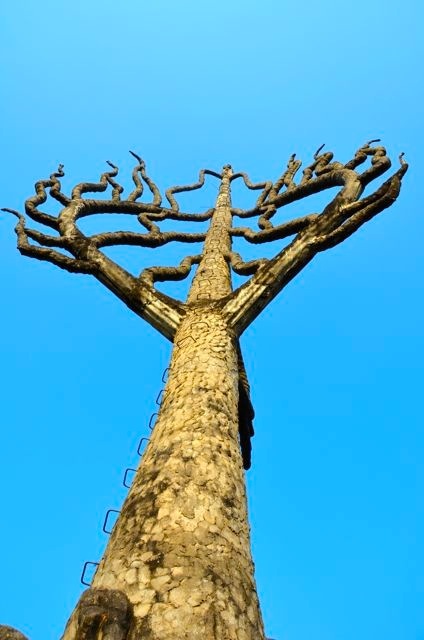 The sculptures are made of reinforced concrete, but be sure to exercise common sense – especially when climbing the ‘giant pumpkin’ – as there is some unexposed rebar, and the railing at the top appeared precarious. Wow Tricia! Looks like you had a great day! Love all the kids’ enthusiasm! My pleasure, Sriram. 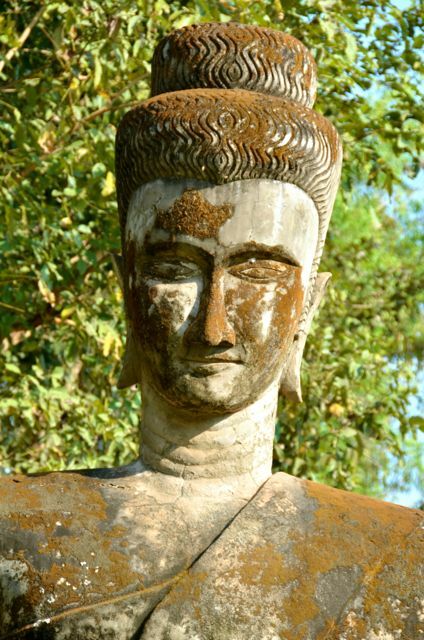 Glad you enjoyed the virtual trip to Buddha Park. :) Have you been there? Given your love of elephants, you’d probably appreciate the fact that Laos was known as the ‘Land of One Million Elephants.’ The elephant population has diminished significantly today, but we were reassured to see several nonprofits doing their part to raise awareness about this issue. Your lovely images brought back memories of a visit there I made about four years ago. 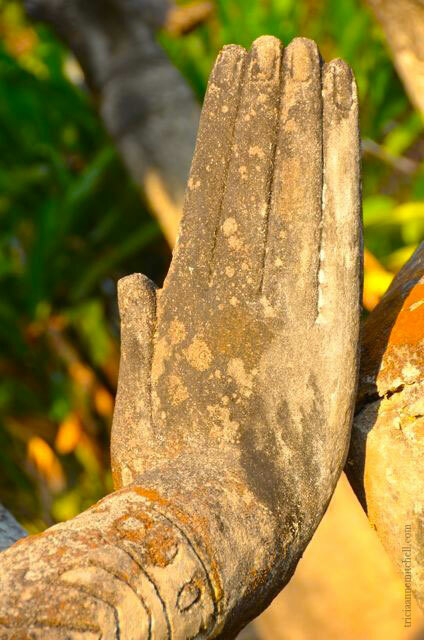 I was lucky – I drove there in a 4wd with friends who live in Laos! An interesting place all round. Thanks for the reminder. Thank you for taking the time to comment, Lee. 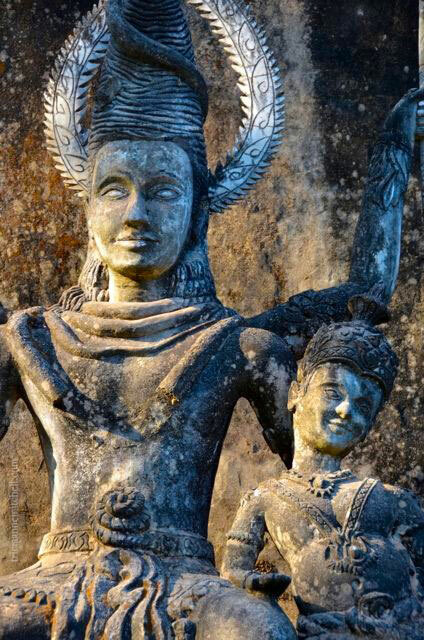 Laos is a beautiful country. 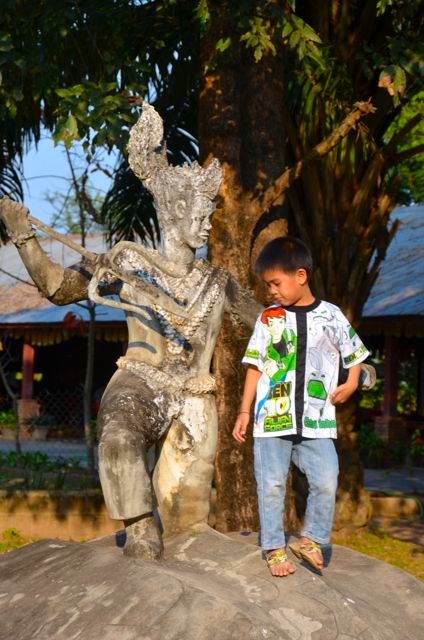 Were you able to visit spots outside of Vientiane? 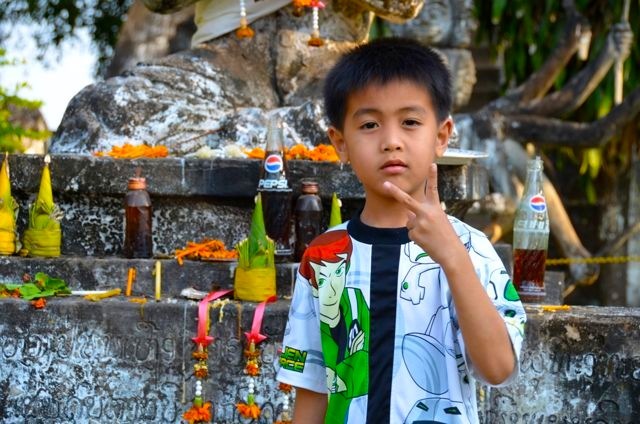 We also enjoyed Phonsavan (the Plain of Jars) and Luang Prabang. 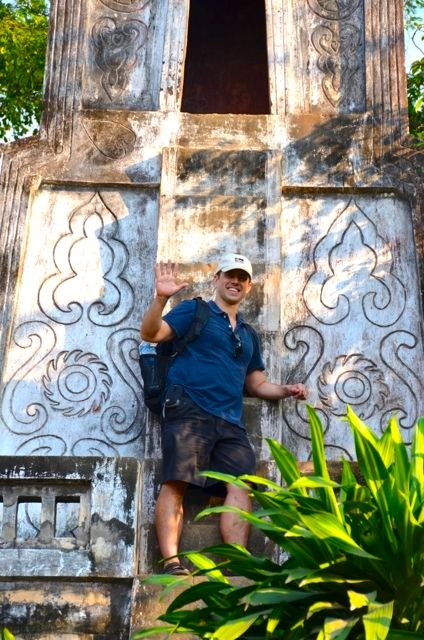 Yes, I spent three weeks in Laos and travelled from top to bottom! I crossed the border from northern Thailand (by small boat) and met my friends (an Australian photographer with whom I was working, and his Lao wife). 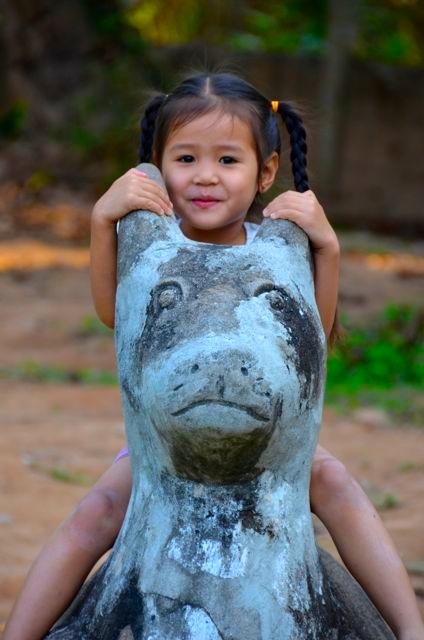 They live in Luang Prabang, but we travelled all over – but sadly not to the Plain of Jars. That’s on my list for next time! 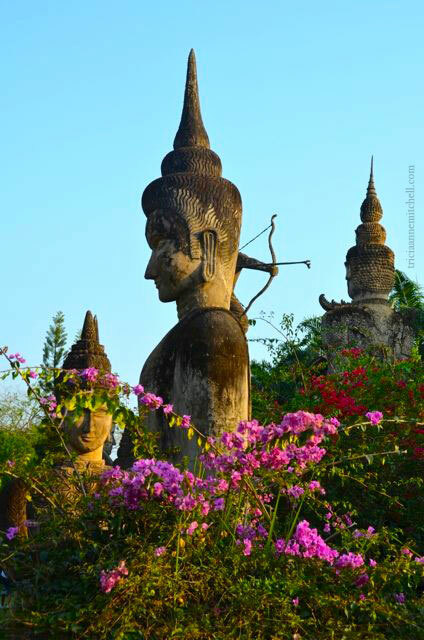 A wonderful place, Laos…no wonder almost everyone who visits there falls in love with it and its lovely people. I just read a wonderful book about one of the ethnic groups that lives in Laos, the Hmong people. It’s called, “The Spirit Catches You and You Fall Down.” Great read and very insightful. Oh, I love these pictures! I pinned this post so I can remember to add this to my places to see. The sculptures are so whimsical somehow. I loved the pictures of the children, too. And your “celebrity” status. That happened to my co-worker and I at the Great Wall in China. We’re in several pictures that strangers took home. It was weird. Juliann, the ‘celebrity status’ is a funny phenomenon isn’t it? 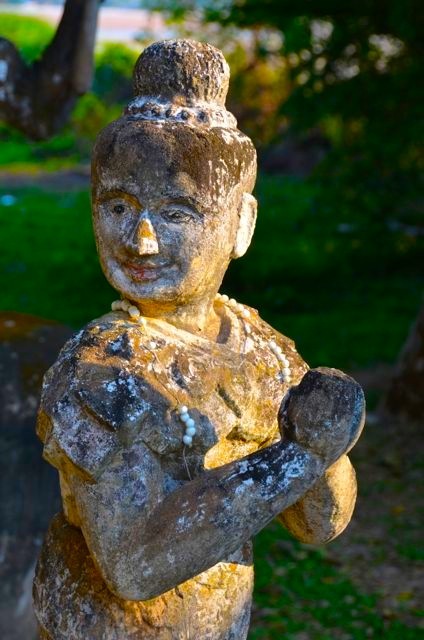 There are many other places I’d recommend in Laos too (Luang Prabang, Phonsavan and the Plain of Jars). 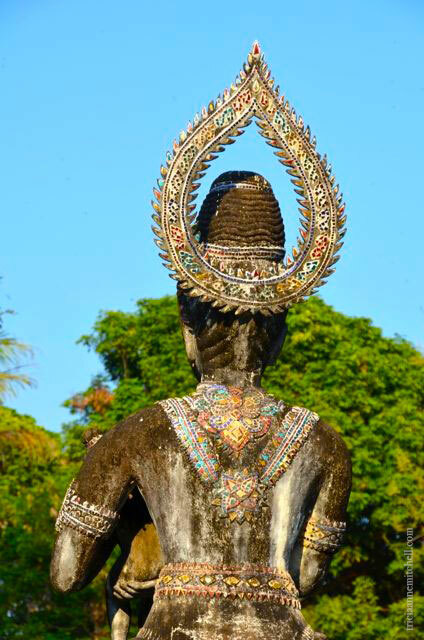 During your many travels, did you visit Laos? How long were you in China? 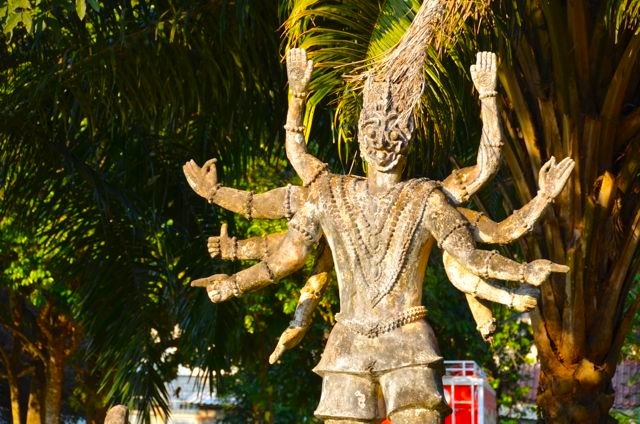 Quite an extraordinary assortment of statues and a lively group there that day. Not what one would think. I believe Wonderlustress had the same experience. So jealous! I was in Laos last year and still miss the place. 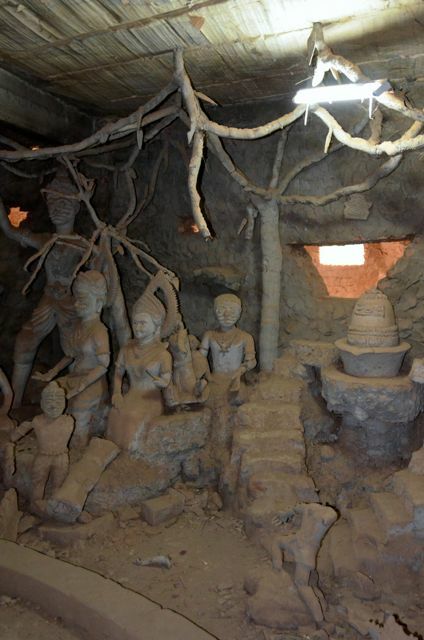 Was in Vientiane for about a day and didn’t get to see Buddha Park. But looks awesome from your pictures. 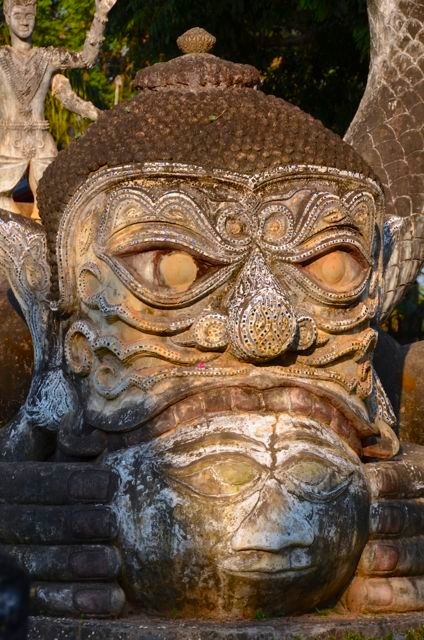 How long did you spend in Laos, and what were some of your special experiences? We enjoyed Vientiane and Luang Prabang, of course, but it was Phonsavan and the Plain of Jars that we found the most interesting. Apologies for the late reply. 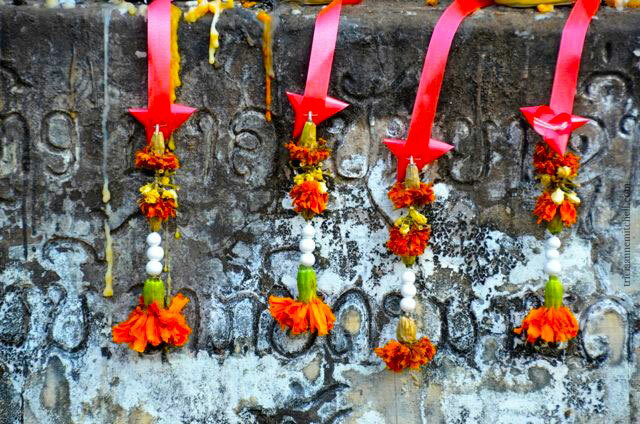 I was there for about 5 days and was in Luang Prabang for most of the time. 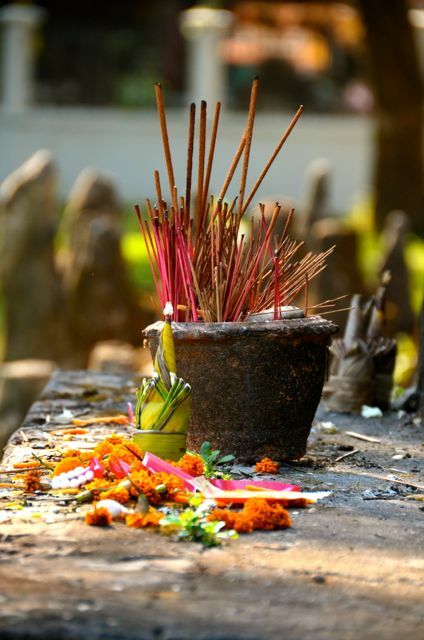 Absolutely loved every bit of Luang Prabang from the food to the Wats…and sipping Beer Lao! 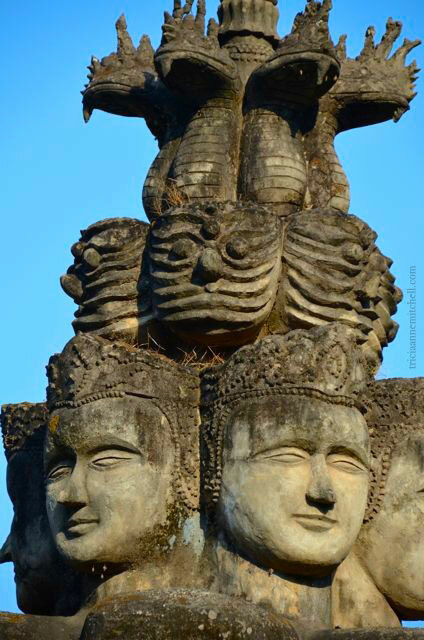 I certainly want to return to see more of Laos. Nong Khiaw in the north for the hiking, the plain of jars & around Vientiane like you mentioned and more of the south too. This looks lovely. The children are so cute. I’m currently saving up to travel Asia but really need to plan where to go in limited time there! Hi Donna – the planning stages of travel are usually so much fun. You must be really excited about your upcoming trip. What region or countries are you thinking about focusing on in Asia? 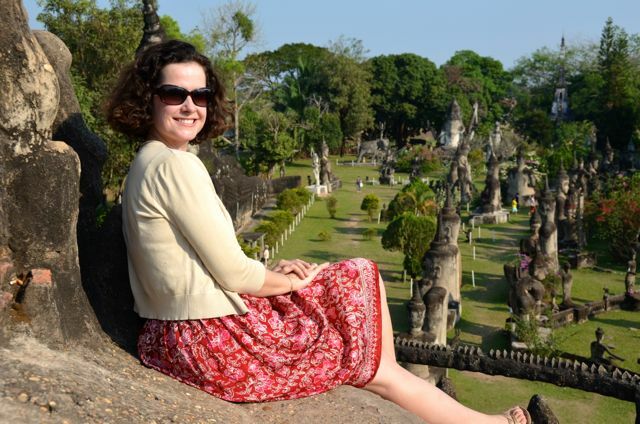 Donna, we visited both countries during our Southeast Asian travels and enjoyed them immensely. I’m still dreaming of the food in Penang, Malaysia, and Hoi An, Vietnam. I’m guessing you’ve probably happened upon some of the helpful sample budgets that other travelers have shared on their travel blogs? It’s also nice that you have a friend in Malaysia that you can consult for advice. :) Either way, happy travel planning! Wonderful pictures. 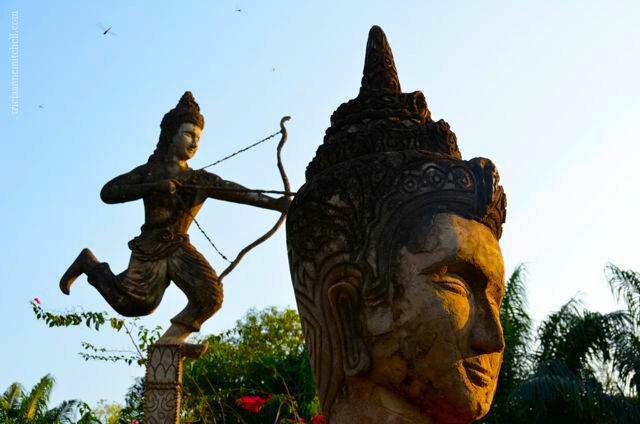 I felt like I was with you in Buddha Park. I really enjoyed this post. The imaginative photos give a good idea of what the park looks like, and it was obvious everyone was there to have fun! Marilyn, what a nice thing for you to say. Thank you. :) It’s been a little over a year since we’ve been to this part of the world, and I have to say that reliving the pictures makes me miss the region. How is your summer going? Virginia, thank you! 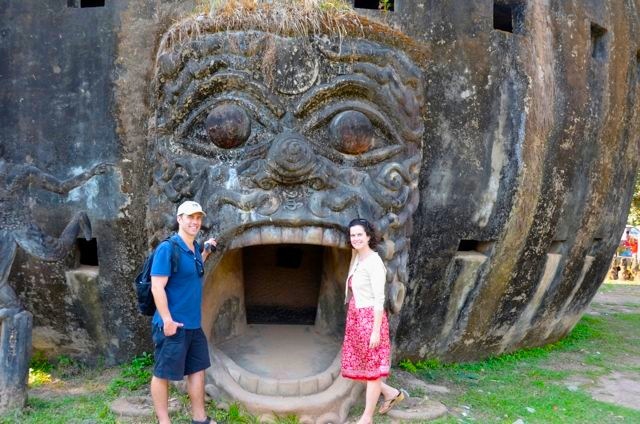 How exciting that your son and daughter-in-law are headed to Laos and Vietnam, two of my favorite countries, which I’ve been lucky enough to visit twice. If they have any questions about their upcoming trip, please feel free to touch base (just as I did when I thought we were headed to their neck of the woods, and was curious about restaurant recommendations). How wonderful, exciting, visually uplifting, and educational, all in one delightful post. I admire your adventurous, traveling spirit. Thanks for sharing, so we can feel like we’ve visited it also. So many thoughtful adjectives; I’m humbled and happy that you enjoyed the armchair travels. Thank you. What a wonderful and whimsical place. We are hoping to get to that part of the world in the next year… so nice to see some places a little off the beaten path. Thanks for sharing! Rameyontheroad, Southeast Asia is a part of the world I’ve been lucky to have visited twice, and I’d return in a heartbeat. :) One part of Laos that was a bit more off-the-beaten-path than even Vientiane or Luang Prabang is Phonsavan and the Plain of Jars. 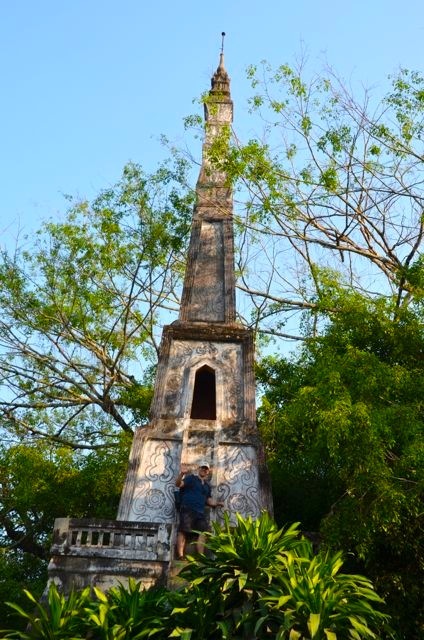 We were saddened to learn more about the history there (it’s the most bombed country per capita in the world, as a result of American bombings during the Vietnam War) since that region of Laos was one of the hardest hit. The region seems to be slowly rebounding, though, and there’s a great opportunity to mingle with the locals there in a way that you possibly couldn’t do elsewhere. It’s a pleasure to connect; thanks for stopping by! Looks like a lot of fun and a great day out, great post Tricia. Glad you enjoyed it Mark, and thank you for the compliment. Where in the world are you now? Just off the coast of Portsmouth, south of England, great weather. Glad you enjoyed it, Gerard. I do miss this part of the world. As usual a beautiful post, Tricia!!! Vielen Dank, Cornelia. Being back in Europe now, Asia looks especially exotic. On a side note, we finally climbed Mount Kofel in Oberammergau. More to come on that soon :) Hope you had a wonderful, sunshine-filled weekend on your side of the Atlantic. It’s those hands again, Tricia- just in another form :) So many beautiful and atmospheric photos. A lovely post. Jo, the hands are reminiscent of the door knocker photo essay that you compiled, aren’t they? 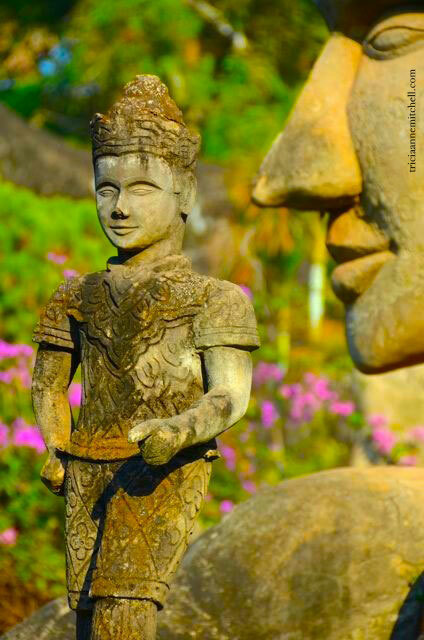 :) Glad you enjoyed the armchair travels to Laos and hope you’re enjoying the weekend. Did you do some photo taking excursions? Loved this post and pics! The reclining Buddha is so elegant. It’s amazing how age and patina can improve even concrete. It must have been wonderful to see all the dragonflies take flight. Oh Tricia, what fun. Interaction with the locals makes the day more special. Great photos! 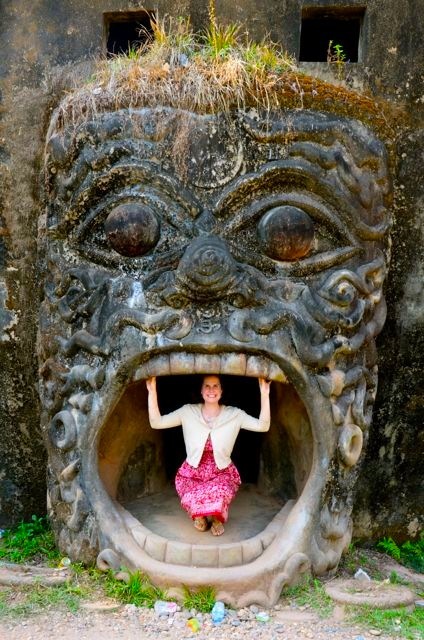 This is fantastic – how I would love to go to Laos (or anywhere in that area!). You had a fabulous day and got so many great photos. So nice that you had the positive encounters with other tourists, too. You’re absolutely right – the park was quirky and beautiful, but it was our interactions with the locals that enhanced the visit. Here’s hoping you’ll get a chance to visit the region someday soon. We were lucky to spend 4 months there two years ago. 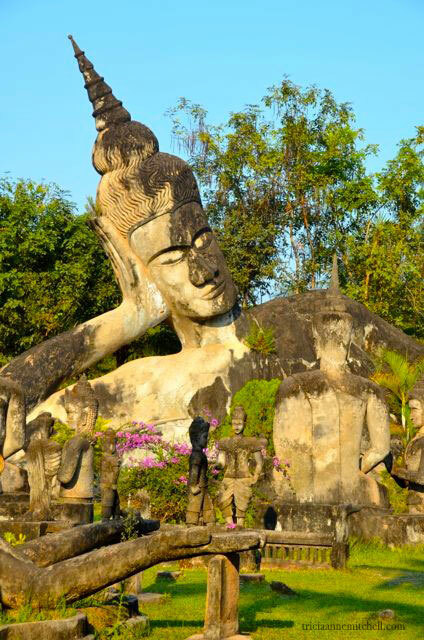 Laid-back Laos was one of the highlights given that parts of the country aren’t yet over-run with visitors. Luang Prabang and the Plain of Jars were highlights for us. 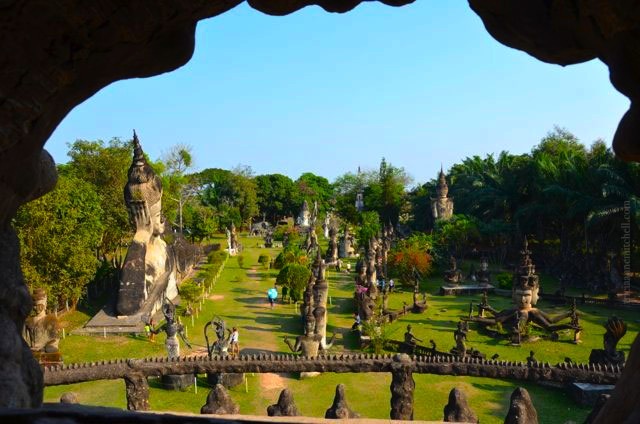 Glad you enjoyed the virtual visit to Buddha Park, Indahs. Such a quirky, interesting, and lovely place to pass a day! Raksx, you must be proud of your home. 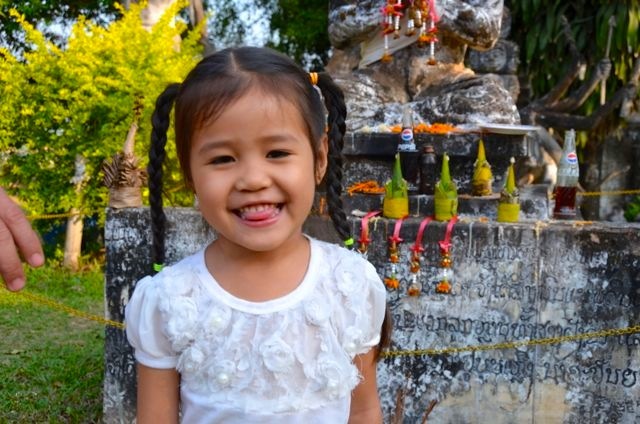 We’d love to go back to Laos someday. What part of the country are you originally from? Tricia, I am of course. It would be awesome if you could go back there. I am originally from Vientiane. Thank you, Technochaavi. 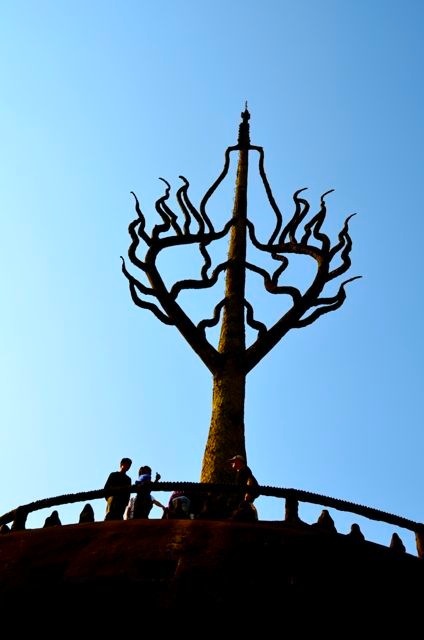 It’s been several years since we’ve visited Buddha Park, but I still remember our afternoon there fondly.